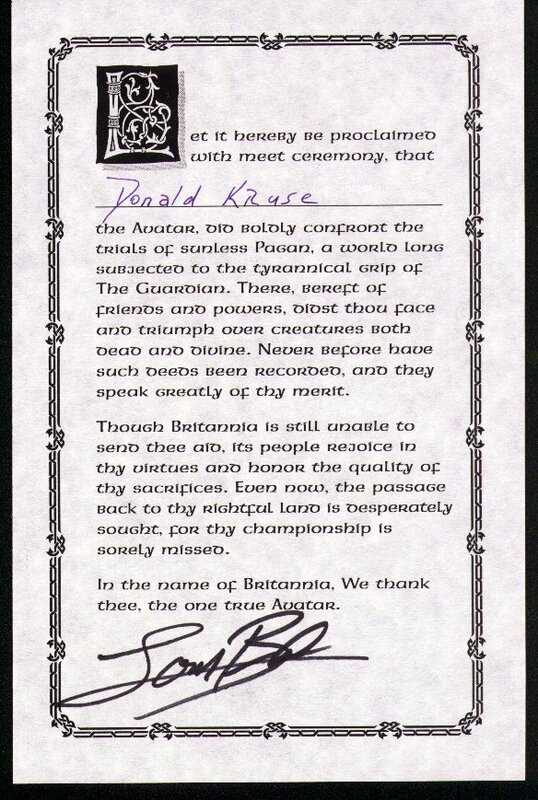 As an overly keen Origin fan and collector, something that has bugged me for years is not having any of the completion certificates for the Ultima games. I’m not even sure if Mindscape sent them out over here in the UK but I was definitely on the wrong side of the world to reach the authors if I had wrote in and I’m not really the sort of person who writes fan letters in the first place. Besides which, I played most of these games years after release and assumed that no one would have been interested. 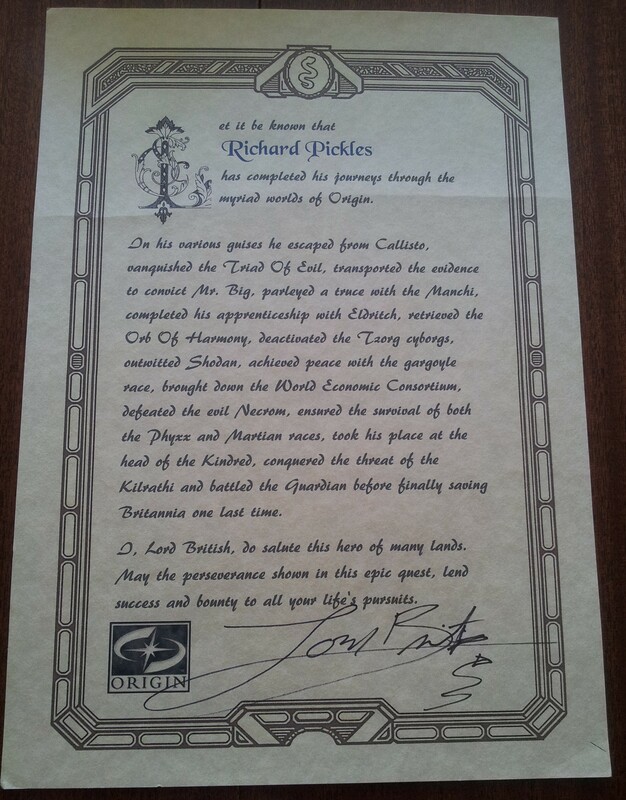 The certificates do occasionally come up for sale of course but would I really want one with someone else’s name on it? I’ve got pictures of them on the site which kind of suffices and I’ve never actively tried to get hold of the real artifact. 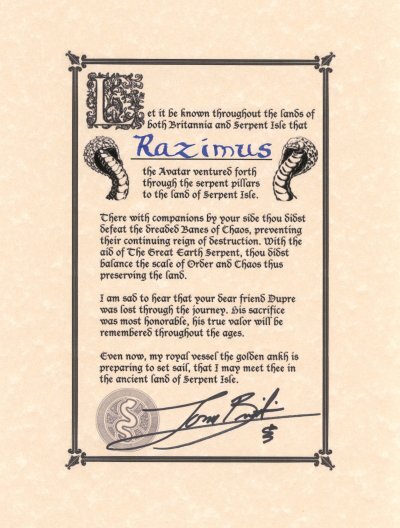 After posting those pictures on here, I found out that the Serpent Isle certificate was actually made and sent in by a fan as no official certificate was ever created for that title. This gave me the inkling of an idea to do the same thing myself, except for the whole Origin catalog. 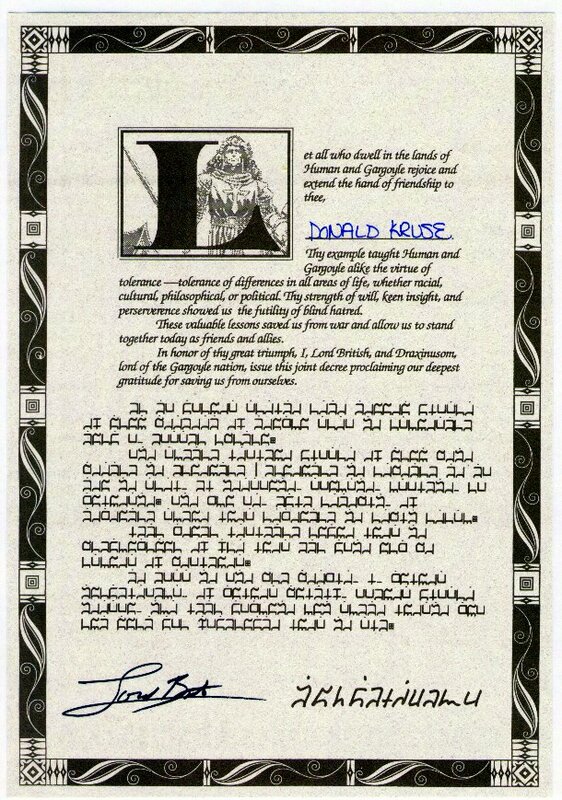 I attempted to make the certificate as authentic by “borrowing” artwork and phrases and filled in the rest by mentioning as many Origin games as would fit on there (which wasn’t all that many in the end). 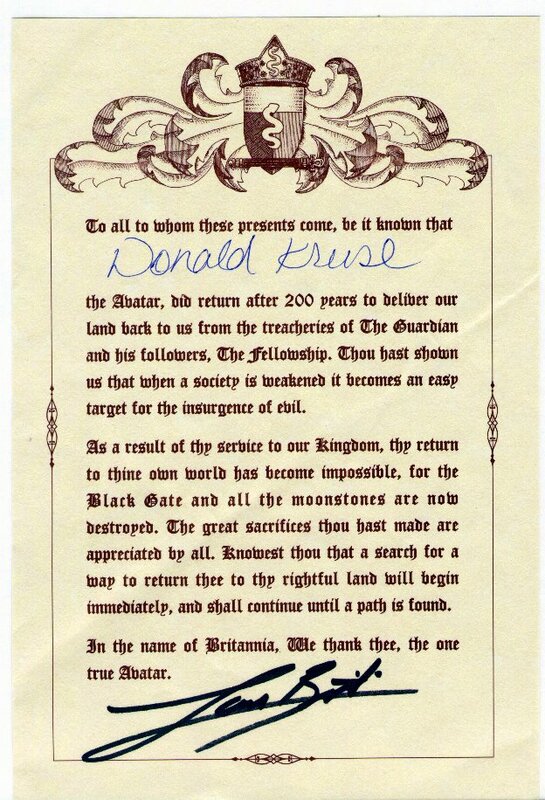 It’s even printed on parchment. Now I get it back again I notice a slight clipping issue on the giant L which wasn’t on my test prints. 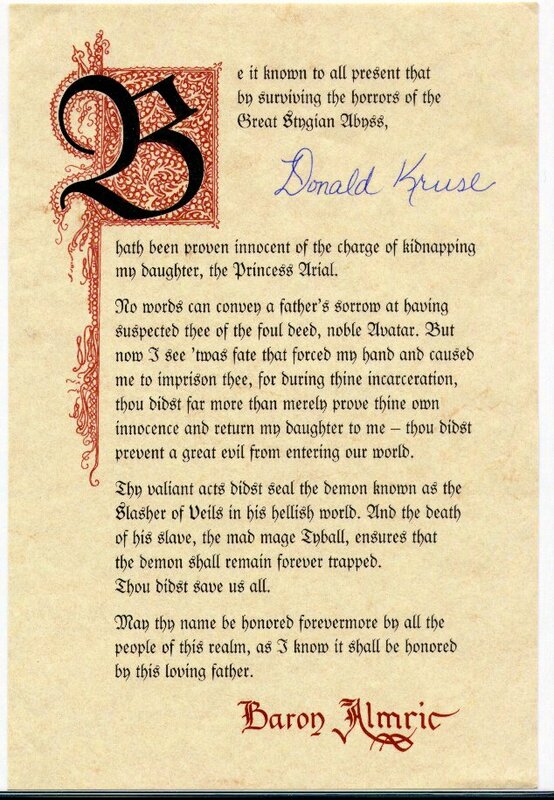 This is what happens when you use Microsoft Word for more than letter writing. It’s also somewhat worse for wear after the 10,000 mile round trip but it all adds character and I think I might just have a new favourite item in the collection. Safe to say this is going to be framed and hung up on a wall somewhere. I’d like to give a big, big public thank you to David and Richard. I’m back from holiday and have a little catching up to do. 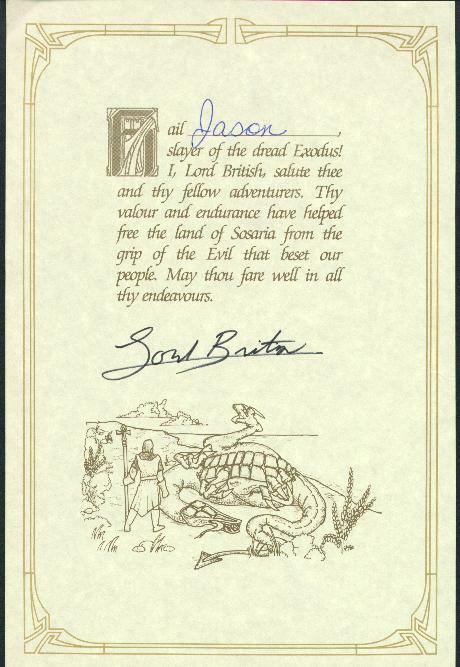 First off, here is the missing Ultima 4 completion certificate which has been provided once again by Natreg, having presumably being hosted originally on Jocksitter Dragon’s website. These are an interesting bit of history going right back to the early days of Origin. 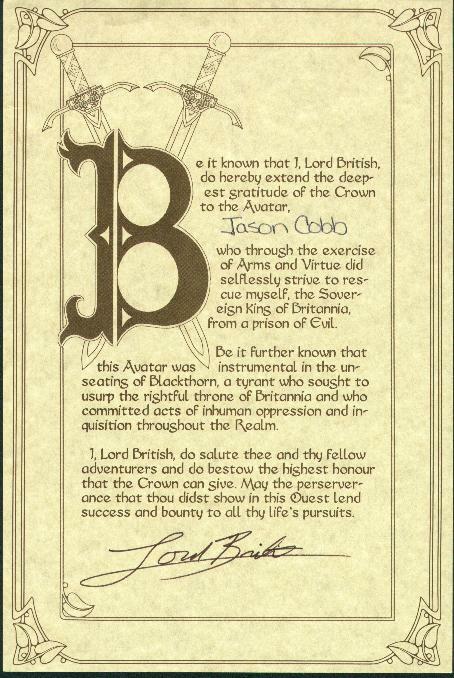 From the release of Ultima 3, Origin started sending out personalised certificates when you completed an Ultima game. All you had to do was ring or write to them after you finished the game and they would mail it to you. Being in the UK, I never actually tried this out for myself. 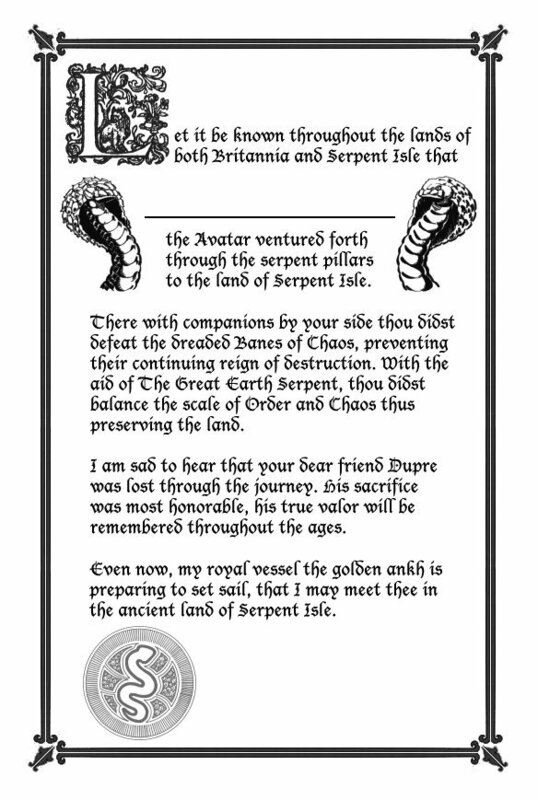 The games end screen would usually say to write to Lord British which was a problem when he was on the other side of the world. 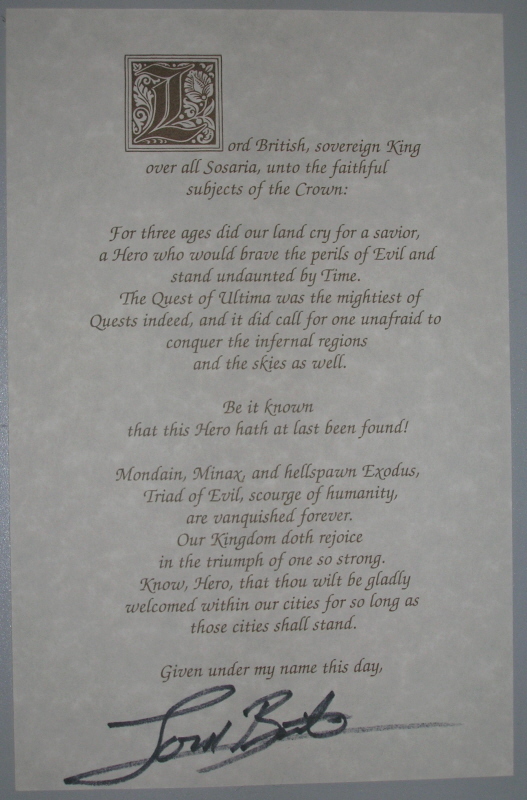 Mindscape were distributing Origin games in England at the time I finished my first Ultima (Underworld), I’ve no idea whether I could have written to them instead but I never tried it. None of these certificates are mine, or even in my possession unfortunately. The scans have been provided by Natreg who in turn got them off the internet at some point. I remember seeing them myself years back but I can’t remember what the site was and if it’s still there I can’t find it. 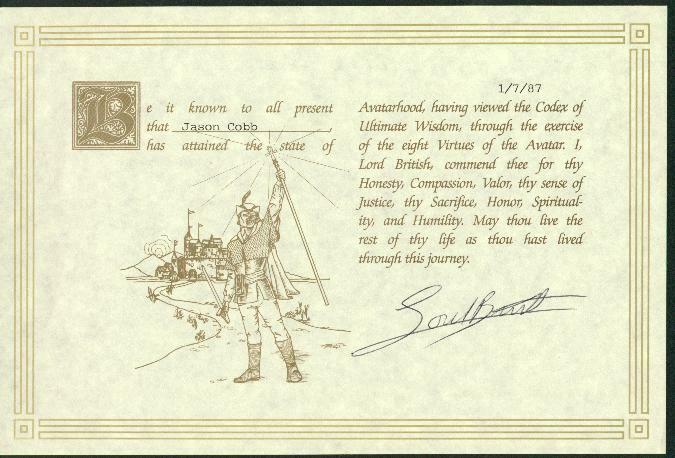 I’ve also included a scan of the Ultima Trilogy certificate which I’ve pinched off a wcnews.com article about some acquisitions of Joe Garrity at the Origin Musuem. There are several missing off the list here, so if anyone has them or knows where they are available I’d love to see them.